Snowpack properties such as snow depth and hardness are significant foraging barriers to northern herbivores in winter when plant quality and quantity are at the lowest. 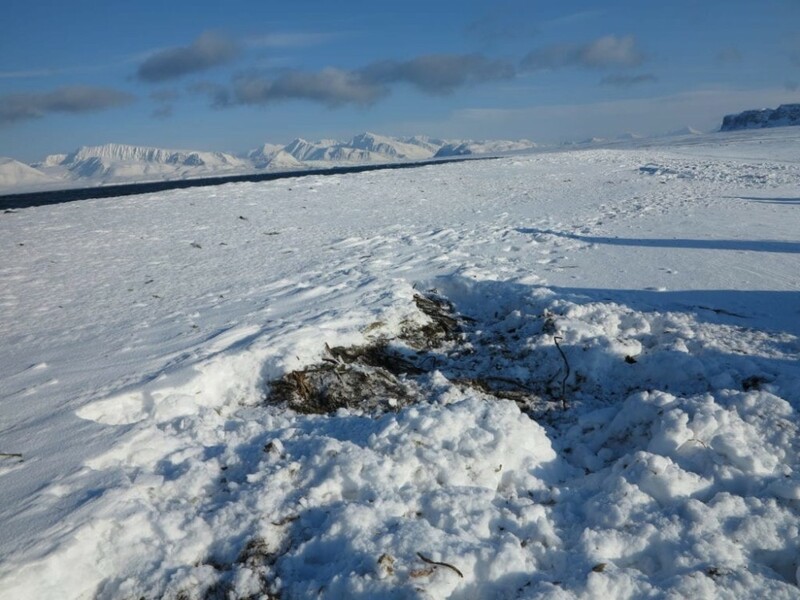 In Svalbard, winter climate change is rapidly affecting the terrestrial tundra ecosystem, mainly due to more frequent mild spells and “rain-on-snow” (ROS) events. ROS events can leave ice layers in the snowpack or on the ground, as heavy rain may percolate through the snow and accumulate on the frozen ground. 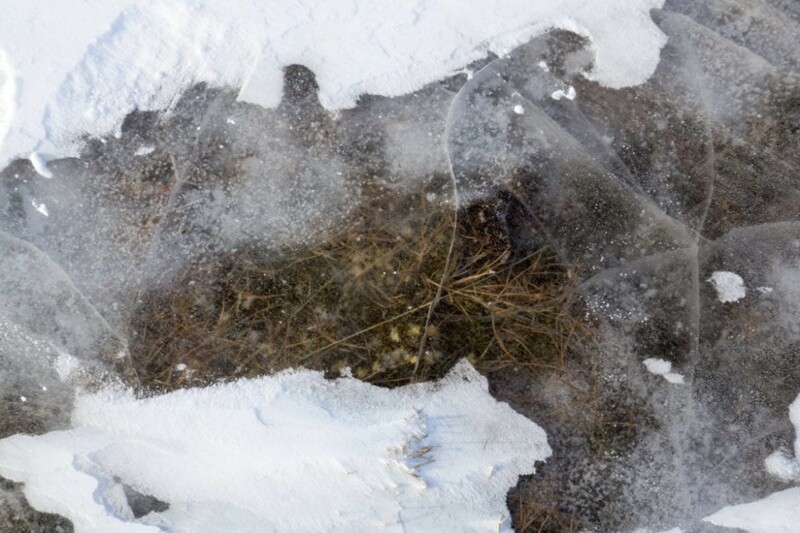 Thick solid ice then encapsulates the plants, making them inaccessible for the herbivores. Small arctic plants encapsulated in ground ice. Photo: Odd Arne Olderbakk. Several studies show the negative effects of ROS on reindeer body mass, in turn affecting survival, reproduction and population growth rates. At the same time, other studies strongly indicate that a variety of behavioural responses to ice-locked grazing grounds – shifts in diet or use of space – may partly counteract negative fitness consequences on the individual level. With increased spatial isolation due to a reduction in sea ice and fast ice in the fjords, the opportunities to escape poor foraging conditions through range displacement and seasonal migration are currently reduced. Thus, the extent to which individuals and populations of Svalbard reindeer are able to adapt to effects of winter climate warming will depend heavily on their ability to adjust behaviour. Feeding craters on the beach. Photo: Åshild Ønvik Pedersen. Studies using VHF and GPS collars on Svalbard reindeer have demonstrated partial seasonal migration, particularly under difficult winter foraging conditions. The earlier view that Svalbard reindeer are confined to small, year-round individual home ranges has been nuanced after GPS-collars were mounted on female reindeer in Central Spitsbergen (since 2009) and along the west-coast (since 2014). A study in Nordenskiöld Land showed that individual reindeer shifted their range, mainly in icy winters, from valleys with a lot of ground ice to valleys with less ice. 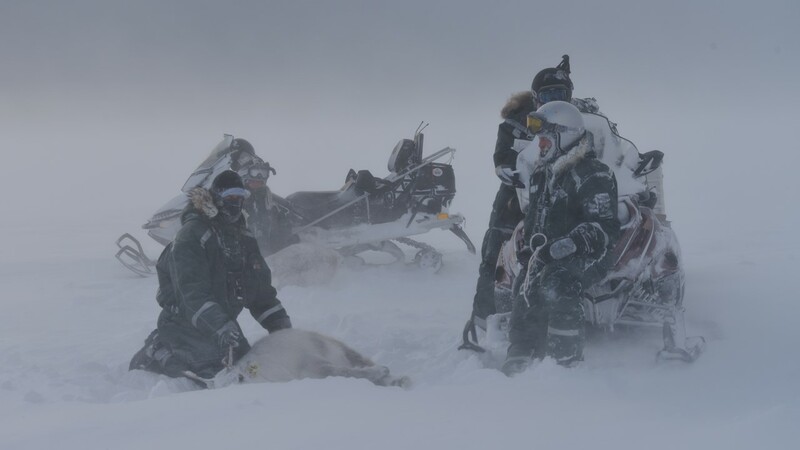 Compared with individuals that stayed behind in the icy valley, the reindeer that moved had lower over-winter loss of body mass, lower mortality rate, and higher subsequent fecundity. On the west coast, when fjord ice was still present in the early 2000s, up to 35% of female reindeer left their home range on Brøgger Peninsula for better winter foraging conditions at Sarsøyra, crossing the fjord ice in Engelskbukta. Recently, however, fjord ice has been absent in the area, and data from GPS-collared reindeer since 2014 suggest that such migration no longer occurs. Increased monitoring, longer time series and improved technology such as GPS collars and stable isotope analysis of diets, have provided new evidence that coastal reindeer use marine food resources to buffer effects of widespread tundra icing. During the population monitoring in the extreme icing winter of 2010, when thick ground ice covered 98% of the lowlands, 13% of the reindeer in the coastal populations south of Ny-Ålesund fed on washed-up kelp and seaweed in late winter. Young animals appeared to be overrepresented among the individuals that applied this foraging strategy, which probably represents a last attempt to avoid starvation under, particularly severe foraging conditions. Our recent analyses based on annual winter population monitoring between 2006 and 2016, along with GPS-collar data and stable isotope analysis of reindeer faeces and their different food sources, now confirm the link between this marine foraging strategy and rainy and icy winter conditions. Although kelp and seaweed are heavily utilised by some individuals, this food source appears to give the reindeer diarrhoea and needs to be combined with more “normal” food plants. Accordingly, the monitoring data from the coastal populations suggest that most reindeer also apply other strategies to cope with poor winter feeding conditions. Some individuals gather in small, ice-free hotspots in the lowlands, using a fine-tuned sense of smell to locate ice-free microhabitat beneath the snowpack. The largest group observed during the annual winter count in 2012, had almost 60 individuals gathered in a small area. Another strategy, particularly common among adult males, is to move to high elevations and steep mountain slopes where ground ice is less likely. Despite extremely low plant biomass at such high elevations (i.e. polar desert), and a substantial mortality risk due to avalanches, up to 50% of the reindeer were located in steep terrain above 300 m altitude during icy or particularly snow-rich years, while few or none used this habitat in more favourable winters. Thus, in recent poor winters, many coastal reindeer tended to forage either at high elevations or along the seashore. This demonstrates a dual spatial response to worsening winter feeding conditions when lack of fjord ice restricts dispersal, with a strong selection for the periphery of the foraging niche. The reindeer module of the Climate-ecological Observatory for Arctic Tundra, COAT, focuses on climate impact pathways on reindeer dynamics and spatial ecology. A substantial part of the COAT Infrastructure funding is for telemetric equipment such as GPS collars that enable researchers to track individuals’ spatial responses and fitness. The targeted instrumentation on reindeer along with an extended climate observation network, in both inland and coastal populations, will enhance our understanding of the spatial responses of reindeer to changes in their habitats. Such knowledge is particularly important under global warming, because behavioural buffering may be crucial for population persistence under rapid environmental change. This is especially the case for long-lived species like reindeer, with long generation time and limited ability for rapid evolutionary adaptation to a new arctic winter landscape. Capture-mark-recapture studies are important for understanding reindeer responses to climate change. Currently, COAT encompasses such studies in both Nordenskiöld Land and along the west coast of Svalbard. Photo: Erik Ropstad.